One week ago, Hurricane Irma barreled its way through the state of Florida causing widespread devastation and displacing millions. Business interruptions caused by power outages, flooding and debris affected all major markets. 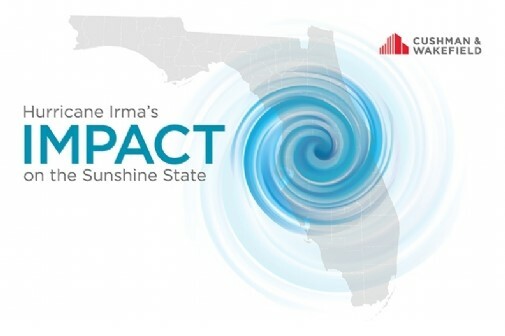 While most Florida businesses were back up and running by the week’s end, natural disasters, like Irma, can have future implications for location decisions and how commerce is delivered. To read more of Irma’s Impact, download the report here. As Hurricane Irma approaches I wanted to share this great article from the Jacksonville Business Journal , written by Derek Gilliam. Fifty-three years ago, Hurricane Dora smashed into Jacksonville, the last time the eye of a hurricane spun over the city. That storm hit September 10, 1964 The official Hurricane Season starts June 1 and runs to November 30. And it looks like Jacksonville’s Chances of being impacted by a hurricane is increasingly possible as Hurricane Irma Approaches Florida’s coast. For business, this will mean a loss of productivity and likely some storm damage. There’s a few things property owners should do before the storm makes landfall. The Jacksonville Business Journal sat down with Cary Fourman, the owner of several franchises of City Wide Maintenance in Florida that have been in the firing line of major hurricanes before. He operates companies in Gainesville, Daytona Beach and Jacksonville. He said that as the storm season ramps up there are several things property owners should do. First, he said, review all insurance policies. Most hurricane insurance won’t cover flood damage and there’s also specific requirements for flood insurance to take effect. Remove antennas or any loose objects on the roof. Take down outside signage where possible. Clean drains, gutters and downspouts on and around the building. If building has exterior glass, clear out that section of the building as much as possible and use shutters or board it up to protect glass. If you have no shutters or boards, strong masking or duct tape may be used. Tape in an “X” fashion on the inside of the glass to reduce shattering. Move equipment from windows to protect them from water damage. Create clearance from ground of major office appliances if possible. Do not leave boxes or equipment on the ground; elevate them by placing items on top of desk or table tops. If time permits, make an inventory of all moved items to ease unpacking after the storm. Cover merchandise, office machines, specialized equipment, file cabinets, copy machines, computer terminals, etc. with tarpaulins or plastic sheeting and secure with sturdy tape. Disconnect all electrical appliances and equipment, except for refrigeration. Close all windows and draw blinds or drapes. Turn off the electricity except for refrigeration at the power box and lock all doors when you leave. Before leaving the property, recheck the securing of the outdoor objects. The State of Downtown Report covered a period starting on January 1, 2016, and ending on June 30, 2017. The report said in the last 18 months, there’s been a combined $83.91 million of construction projects completed and $825.98 million.